The result of your grilling or smoking is as good as your preparations. Using a high quality cooking knife is one of the things that can improve our cooking in and outside. Nothing is more annoying to me when I start a day full of grilling to have a dull knife. First thing I do is make sure my knifes are sharpened. That is why I spend a good amount of money on my knives. I have found one brand that I like most and almost all my knives are from that brand. Here is my personal choice. This is in my opinion the best boning knife especially for chicken and other poultry. You know how hard it sometimes is to cut through bones in a chicken or turkey. I promise you that with this knife you will have a lot less problems. This boning knife is made of Forged high carbon stainless steel. Forged means hammered and not just stamped out of a mold like many other companies do. I read somewhere that a forged carbon stainless steel knife can break when it falls on a hard surface. Although I have not found any proof of that I still thought I should mention it. The handle is made of composite material and nothing special, but a little better quality. The knife can be washed in the dishwasher but I learned from a chef that it is better to wash your knifes by hand. This will keep them longer sharp. This knife comes in 5 and 6 inch, and both are very flexible. I prefer the six inch, but you might like the 5 inch better. The knife is expensive, but worth every penny you spend on it. I found that several users give this flexible boning knife an average of 4.9 stars out of 5. There is nothing you need more for prepping than a good paring knife. This Wusthof 3.5 inch paring knife comes with a pointed blade and is also made of forged high carbon stainless steel. The handle is pretty standard, but works good. The shape of it is not much better than cheaper brands, but it feels good. Like I mentioned about it can be used in the dishwasher, but I do recommend washing it by hand. 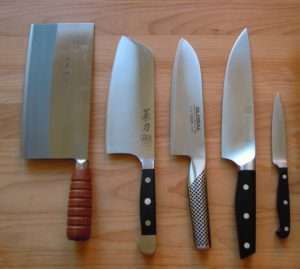 Having a good paring knife is a very important part of cooking and will improve the overall quality of your cooking. When it comes to cutting ribs, briskets and other larger cuts of meat I prefer the Victorinox 12 inch Granton. This knife is made in Switzerland and made out of high carbon stainless steel, with a granton edge. This are the little dimples you see on the side and this improves the cut by separating the knife better from the blade. The handle is called a firebox handle and this means slip resistant and ergonomic. All great but it just cuts real good and straight. Cheaper knifes often cut not straight or slice not good enough. With this knife you will no have that problem. 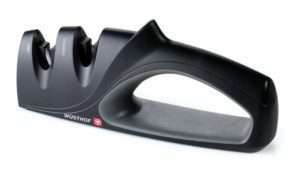 The Wusthof knife sharpener is a very good knife sharpener. It uses 2 stages for sharpening. The rubber base makes sure it will not run all over the counter top. Very affordable to sharpen all your knifes and scissors. personally I like to use a steel knife sharpener in between using my knife and when I feel it needs a little touch up. Although they are very inexpensive most people do not have one. Here is a video on how to use a steel in between your cutting. Here is a link to a Cheap but good stainless steel knife sharper on Amazon for around 10 dollar.